Driver is one of the computer components which are really important because the computers performance will not be maximize without the right driver. Even though usually driver for computer/notebook is already included in the CD, but it’s not unusual that we have to update to make it up-to-date, because an up-to-date driver can fix and increase the computer performances. Because of that, it’s really important for use to backup the available driver. When we have driver in form of an application (installer), maybe we don’t need backup, because when we have problem and need to be reinstalled, we can directly install that driver. Problem happened when the installed driver is the result of an update or automatic install from the internet (online), like from windows update and it’s happening a lot especially laptop (notebook) or netbook users. 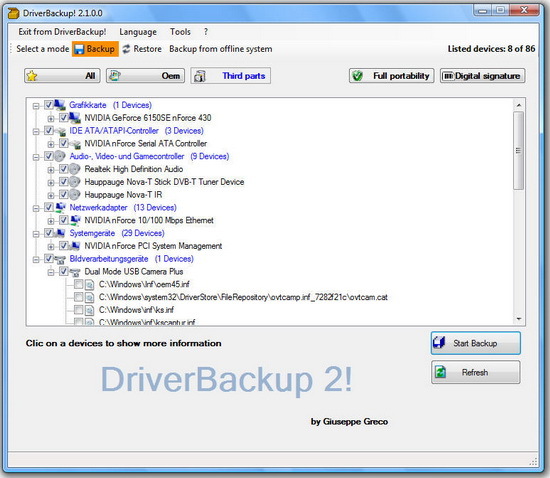 The backup the driver available in the windows, you can use free software (open source), DriverBackup. DriverBackup! Is free software which used to backup and restore the drivers available on our computer. Other than the good ability to handle drivers on Windows, this application also have a small size(on zip it’s only around 445KB) and also portable, so you won’t need to do installation to run it. OEM, shows the one that used Microsoft drivers. Do you have a tool you use or another method of backing up your drivers ? If you do, please share them with us in the comments !